History lovers will surely love spending time at Hot Springs’ most iconic district: Bathhouse Row. It is composed of eight surviving bathhouses dating back to 1830 and described as the grandest collection of bathhouses of their kind in the nation. Along with the Grand Promenade, the area was designated as a National Historic Landmark District in 1987 and has become the architectural core for downtown Hot Springs. Follow us as we tour you around this historic district, provide you with an escape into the past, and explore this city’s colorful history. As you travel down Central Avenue from south to north, the very first bathhouse you will see is Lamar Bathhouse. It is named after former U.S. Supreme Court Justice Lucius Quintus Cincinnatus Lamar, the Interior Secretary when the bathhouse was built in 1888. 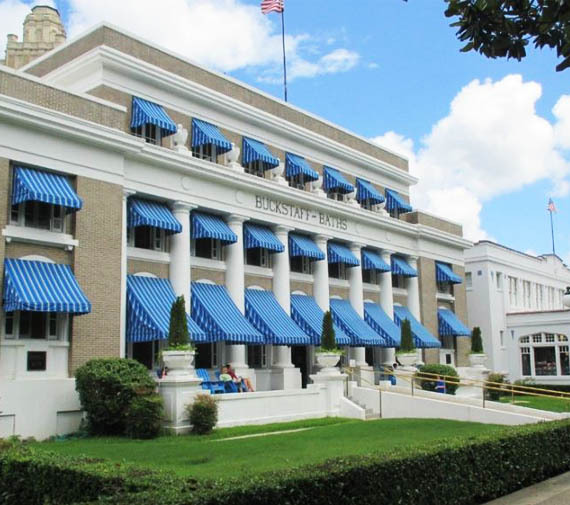 The Lamar Bathhouse is one of six bathhouses with Spanish-style architecture with its gorgeous white stucco façade. It offered a range of tub lengths to accommodate people of various heights and a coed gym with a separate area just for women. Today, the Lamar is home to the Bathhouse Row Emporium and several National Park offices. The Emporium is the place to go for the latest in spa apparel, bottles that can be used to fill with water from the hot springs, and history books. Just beside the Lamar Bathhouse is the Buckstaff Bathhouse. It is the only bathhouse left to still be in operation since its opening in 1912. It is named for controlling shareholders George and Milo Buckstaff. The Buckstaff bathhouse has indeed undergone many changes over the years, but it is still one of the best preserved of all the bathhouse. This 27,000 square-foot, three-story facility is your go-to place if you are looking for a vintage spa experience, which will begin as soon as you step into the building with its vintage-style floors. Bath packages offer the famous traditional bathing experience and beyond so it would be best to call ahead and make an appointment if you are planning to make this a stop. Next stop is the Ozark Bathhouse, named for mountain range that surrounds the city of Hot Springs, Arkansas. It was built in the style of the Art Deco movement and is one of the smaller bathhouses with a 14,000 square-foot area. It is housed between two towers that flank its beautiful front porch where you can also sit and relax. Although the façade screams luxury, it was actually the bathhouse to visit when you did not want to pay for a lavish experience. Today, it houses the National Park Cultural Center’s art gallery and continually features several artists in residence and other preserved architectural pieces that offer a glimpse into the past. Venturing on, you see the magnificent domed architecture of the Quapaw Bathhouse, named after the Native American tribe who lived in the area. It is the longest building in Bathhouse Row, occupying two previous sites of two separate bathhouses. Out of all the bathhouses along Bathhouse Row, it is definitely the most stunning and is famous for offering modern spa services in a traditional-style setting. It was recently renovated in 2008 and has looked more stunning than ever. They offer a wide range of spa services, including the famed public thermal pools. Ah, the legendary Fordyce Bathhouse. No trip to Bathhouse Row is definitely complete without a visit to the largest bathhouse in the city. It is a 28,000 square-foot building with three floors and large basement. It was named after owner Sam Fordyce. The Fordyce Bathhouse was built to be the grandest of the eight bathhouses along Bathhouse Row. It offered many different services, more than any bathhouse, which included a beauty parlor, an assembly room with a grand piano, a shoeshine stand, a men’s parlor that had a pool table, and a roof garden. Best of all, it provided mineral baths for people who wanted to experience the healing powers of the waters of Hot Springs. Today, the Fordyce Bathhouse functions as a museum and houses the National Park Visitor Center. People are offered a glimpse into the bathhouse’s and city’s history with a tour around the bathhouse’s many amenities, including witnessing the bathing ritual from start to end. Continuing our tour of Bathhouse Row, we arrive at the Maurice Bathhouse, which operated until 1974. During its time, the Maurice had a gymnasium, a roof garden, two elevators, and a pool, the only one of its kind along Bathhouse Row. The third floor had a Craftsman-style den with a stained glass ceiling and a frieze hand-painted by artist Frederick Wernicke. Today, it is the only bathhouse that does not have an existing contract or lease and does not have a tenant. Next on the tour is the oldest bathhouse along Bathhouse Row, the Hale Bathhouse. Hot spring waters ran through the basement through a tiled enclosure. It was also connected to a thermal cave carved out of the mountain that was used as a hot room. Contract negotiations are already underway to turn The Hale into a boutique hotel with nine suites, each provided with thermal waters from the many hot springs in the city. This will also include a meeting room, restaurant, and bar. Our last stop in this tour is the Superior Bathhouse, aptly named for the superior service it strived to provide. It is actually the smallest bathhouse along Bathhouse Row with 11,000 square feet of area. From its opening in 1916, it had offered several basic services and had the lowest rates. It now operates as the Superior Bathhouse Brewery, offering only beer made from thermal mineral waters. It also has a restaurant and can be leased as a special event venue. Beer and food – what a fitting end to our tour of the iconic Bathhouse Row.